Justin is the youngest Power Ranger yet. 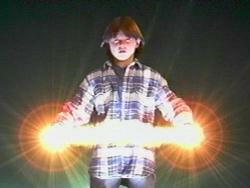 His enthusiasm and energy helped him adapt to his responsibilities as a Turbo Ranger. Justin is a child genius with an intellect far past his peers. This gift has led to Justin being skipped ahead to 9th grade at Angel Grove High School. Justin's mother passed away several years ago leaving Justin alone with his father who ran a martial arts school. His father Dean Stewart, whom he learned martial arts from, began to lose his faith in martial arts as well as practically everything around him and in an attempt to try and cope with this he moved about trying to find a job as well as new meaning in his life. This left Justin to live in the "Little Angels' Shelter" as an orphan. Justin discovered the identities of the Power Rangers Zeo by accident while Rocky was recovering from a back injury in the hospital. 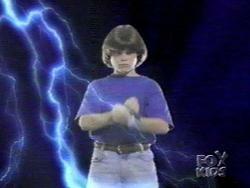 With Rocky in the hospital, the Power Rangers were short a member when they needed to be at full strength in order to fight Divatox. 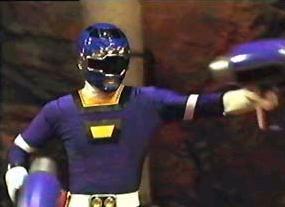 Rocky chose Justin to be his replacement during the crisis and to become the Blue Turbo Ranger. After Rocky recovered, he left the powers with Justin and chose to retire from a life as a Power Ranger. Justin's father recently returned to Angel Grove and established residency with Justin only to have to move away again in pursuit of a new job. However, he was not willing to move away if Justin wanted to stay in Angel Grove. Justin not wanting to disappoint his father made the tough decision not to accompany his fellow Rangers into outer space and thus move out of Angel Grove. 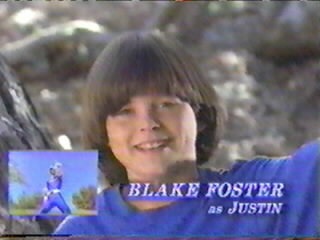 As the Blue Turbo Ranger Justin controlled the Mountain Blaster Turbo Zord as well as the Siren Blaster Rescue Zord. Justin also piloted the Storm Blaster.